The IESO's second estimates for November put the global adjustment rate at $55.68/MWh for November, which is more than double the weighted average HOEP rate of approximately $26.52. November saw new rates for customers under the OEBs Regulated Pricing Plans (RPP) that should average $79.32/MWh, so November's charges, if not adjusted downwards, would reverse the summer's trend where customers with RPP rates paid more than customers without them - business exposed the the commodity charge (HOEP + GA) will see rates rise almost 14% from November 2011. They'll need to revise upward their estimate of $542 million by close to 10% if the final ends close to my estimate of $585 million. The overall value of the total market continues to be relatively stable, as does demand. 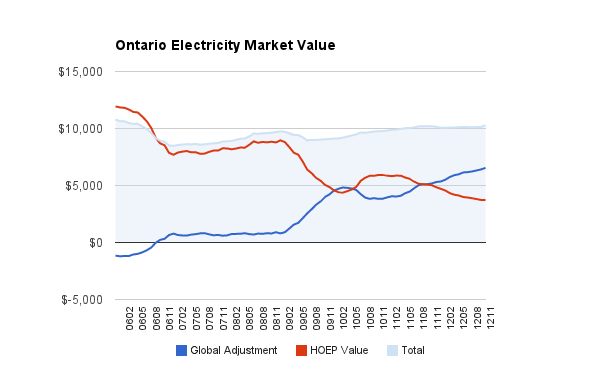 The impact in transferring charges from the HOEP rate to the global adjustment does cause Ontario rates to go up because export customers don't pay the global adjustment - meaning in November export customers paid 1/3rd of the price Ontarian's did. 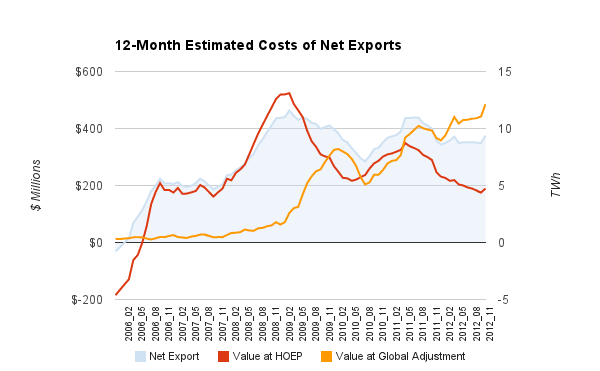 The annualized difference between what export customers pay for all net exports, and what Ontarians pay for the same amount of electricity, is approaching $500 million dollars. Wind powered generation was down significantly from both October 2012 and 2011's November - 'wind down/coal down' following the 'wind up/coal up' relationship of the preceding periods.